An author may write about how things were in their past or in their relationships. In this case, I wrote about something that was missing from my childhood, a loving Father who would have acted as the Father in this story; I wrote the Father who I wished I had. The boy Harley is me, as a young adult, all the way. All of the other aspects of the story are either incidental or minor, borrowed facts. As a whole, the story is fiction. Writing can be therapeutic and this kind of writing is definitely a way for me to explore and settle issues from my own past. 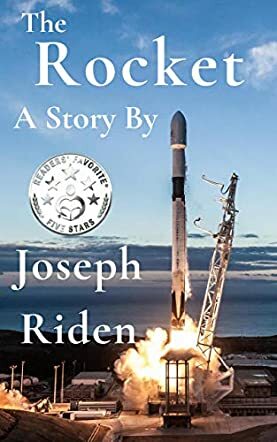 In The Rocket by Joseph Riden, young Harley longs to look more like his often-absent, hardworking father, yet Harley’s heartfelt wish is one that will never come to be. His pesky younger brother, Darren, holds that honor, so Harley, who is precocious, craves their father’s attention, wanting to be like him. When the Soviet Union launches the first Sputnik satellite, Harley’s imagination soars among the stars. He secretly sets out to build his own rocket and, not understanding the danger, he experiments with a concoction to fuel it. Will Harley’s experiments go too far? How will his parents, particularly his father, react when they find out what he has been doing? The Rocket by Joseph Riden is a letter in book form that reads not only as a tribute to a boy’s dreams of rocket flight but also as a tribute to the boy’s father. This father, who works hard to provide for his family, does not quash his son’s dreams of building rockets but also does what he can to support and take part in his son’s soon-to-be successful rocket experiments and beyond. Riden’s style of writing is wistful yet exuberant as he fondly recalls his long ago childhood, his first experiments with the science of building rockets, yet, more importantly how his actions eventually draw his family closer together and help his parents’ realization that the boys were growing up fast. A quick yet gentle read, The Rocket will help us readers to remember childhood and those who helped us realize our dreams, something we should all do again.